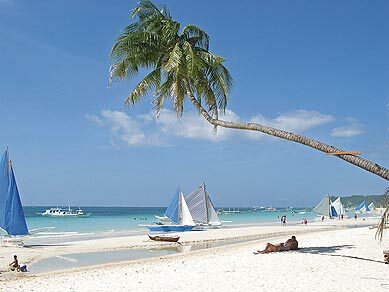 Boracay is about an hour's flight from Manila in the Philippines. The beautiful tropical island serves many domestic & international tourists through out the year. The awesome long white islands proves to be one of the toughest rivals to some of the best beaches of popular destinations such as the Caribbean, the South Pacific as well as neighbouring Thailand, Malaysia and Indonesia. There is a definite facility for tourists with different areas of interest. The beach-front hotels usually have lounge chairs set up just a few steps away from the hotel entrances for people wanting to just lounge around and take in some rays. For more active pursuits you could find water sports activities like wind surfing, diving, snorkeling & jetsking. You can also experience fantastic night life in Boracay as restaurants & bars serve food & drinks till late evening.